source but wants a truly analogue character. was possible with standard red-book CDs. development in the world of digital audio design. generation 64 Bit Pulse Array system. DAC and WTA long tap length digital filter. locking frequency for enhanced performance. 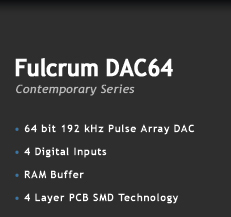 'Fulcrum DAC64 Digital Engine' PDF.